Not only is office design important for your team, but it also makes a big impact on your guests. You may think of an exquisite water feature or an on-site workout area when you think of cool office features. But impressing visitors doesn’t always require those types of elements. Having office features that wow means to creating an environment that leaves a lasting impression on visitors. The lobby is your first opportunity to wow guests with your office space, and it’s the last area that they see. A lobby serves two purposes: a place for guests to check-in or get information and a place for guests to sit comfortably. Offering comfortable seating, complimentary water, a TV, plants and reading material are a few ways to make visitors feel at home. Going an extra step and adding large imagery behind the front desk – whether it’s your logo or a piece of art – will make the reception area a focal point. And a front desk that is distinct makes navigating your entrance easy for guests. “American workers spend approximately 90% of their waking hours indoors, many of them at computer workstations far away from the closest window,” states Edin Rudic, creative director at MKDA, a NYC corporate interior design firm. “Because limited exposure to natural light can negatively impact mood and productivity,” bright light allows you to see the office clearly, which makes people more productive and feel eager to enter your space. If you don’t have multiple windows producing natural light, install numerous light fixtures throughout the space. Having all areas of your office illuminated will ensure the entire office is welcoming and visitor-friendly. A common area with a view is another office feature that wows. Perhaps your office doesn’t have many windows, but there’s a terrace that offers sweeping views of the neighborhood or entire skyline. Or, maybe your conference room or kitchen area offers a picturesque scene through large windows. A good view is not only a wow factor, but it becomes a conversation piece. Guests are impressed when you anticipate their needs. Having a conference room stocked with refreshments, pens and notepads will be appreciated. (Bonus points if your items – coffee mugs, pens, etc. – are branded!) And, easy access to Wi-Fi will put guests at ease while they are preparing for a meeting. It’s the small details that make people feel like you went the extra mile to accommodate them during a visit. Hospitality is an intangible office feature that will wow every time. Incorporating the company branding into the office design is a very attractive feature. It gives guests a well-rounded picture of who your company is, and the imagery will stay with them. Include brand colors as accent colors throughout office elements, like in furniture, décor, flooring and art. The continuous theme with pops of color throughout provides an upscale, designer touch. A feature wall grabs visitors’ attention because it represents what your business finds inspirational. One idea would be to install wall planters, creating a wall of greenery that breathes life into your space. Another idea is to reserve the wall for large, framed photos of your city, team, pets, or achievements. Or perhaps the wall features a mural by a local artist. Regardless of what you choose to display on a feature wall, it should inspire your team and serve as a topic of discussion. People love seeing raw materials, like glass, wood, stone, metal or exposed ductwork, because of the feeling associated with the material. A wood plank wall could give off an earthy vibe, just as exposed brick may indicate historic charm. And exposed ductwork may feel contemporary and crisp. Since these elements don’t appear in all offices, making them unique and modern. You don’t need a two-story building or an open-air atrium to create the wow factor in your office space. Creating an impressive office environment involves creating a functional and inviting space that people can’t wait to revisit. We would love to put some WOW into your office space. Our clients find that even a small investment makes a big impact. 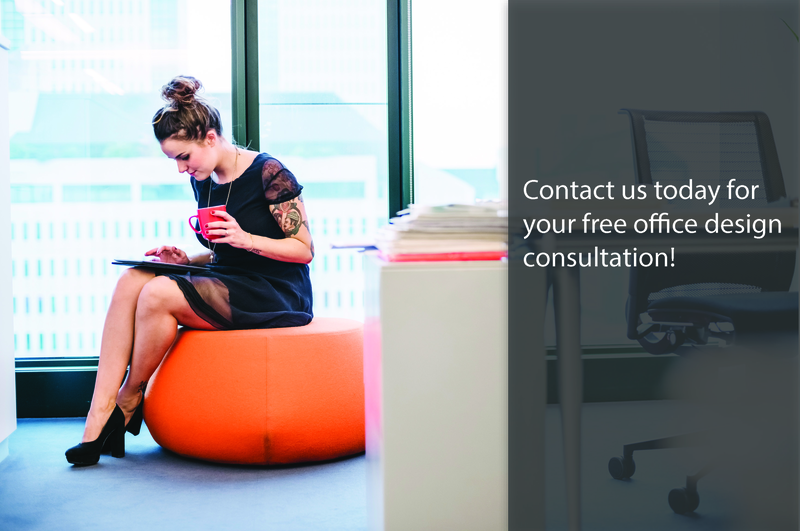 Reach out today for a FREE CONSULTATION to see how a little can go a long way in your office!